Install perilex plug - MrFix finds you a reliable electrician within 3 hours. Install perilex plug - MrFix finds you a reliable electrician within 3 hours. Install perilex plug? Ask MrFix! How do I request an electrician? Ik zoek een elektricien of loodgieter in Amsterdam om de Honeywell VC8015 (zie foto) stadsverwarming adapter te fixen (plastic palletje maakt tikkend geluid). For installing electrics we charge a fixed rate of €80 per hour including VAT and call-out charge. For jobs involving the installation of a new Perilex plug we always recommend hiring hiring an electrician. An electric stove requires a much stronger power supply than most other domestic devices do. The electrical power system should be able to feed 4 (or sometimes even more) hotplates plus an electric oven at the same time. A regular power socket cannot deliver such power in a safe way. Therefore alternative solutions have been developed. A very popular solution is the installation of a Perilex socket + plug combination. 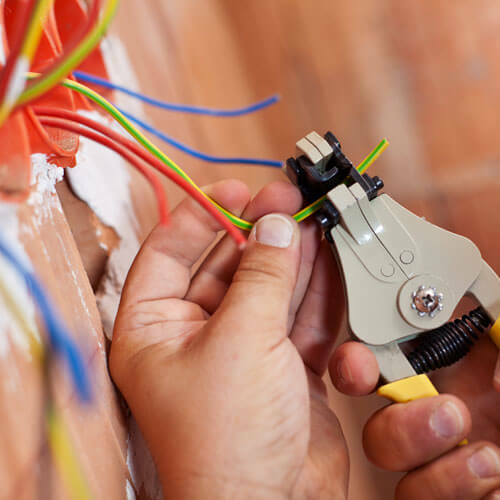 The installation of a Periflex connection should be done by an experienced electrician. Home repair service MrFix gets you a qualified electrician to do the job. We work quickly, conveniently and at fair rates. Its’simple: fill out the form and we will match your install electrics job with the right professional within three hours. Easy, right? You also may call us at 020-6750333 or send us a WhatsApp message at 06-15380087 or send us an email. Specify further relevant details of the install electrics job at “DETAILED JOB DESCRIPTION”; be as specific as possible: specify product to be installed or connected, space available or any obstructions or other limitations. Choose if you prefer “An expert ASAP” or “First a quote”. If you choose “First a quote” then we will provide the expert’s estimate. And if the job is bigger than ~€500 or 1 day of work we will quote his fixed price, usually after a (paid) inspection visit. Are you going to work with electricity yourself? Then always switch off the power group concerned and make sure that you know about the right working methods. An error can lead to a dangerous situation. If in doubt, ask advice from a qualified electrician or call in a qualified electrician. For further questions about electrician rates see “What does it cost” on Help / FAQ or call us on 020-675 0333. For urgent install electrics jobs you can contact MrFix. We will connect you to the right electrician within 3 hours, and often faster than that. For jobs that must start within 24 hours, after 18h or on weekends we charge a surcharge of 50%. Some electrical jobs, such as power failures, simply cannot wait. That is why MrFix has an electrician ready for emergency situations 24 hours a day, also on weekends. 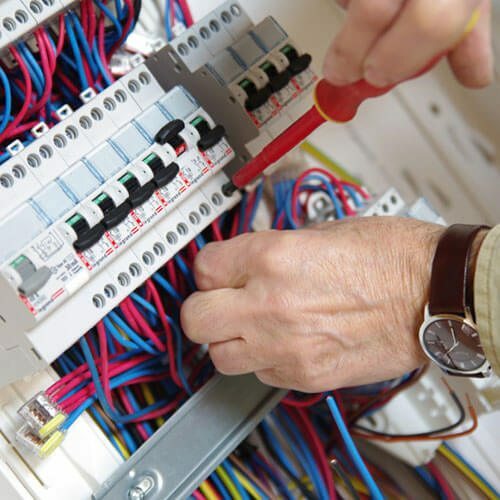 Our qualified electricians can be available in the West and Centre of The Netherlands quickly. We serve the whole western conurbation (the Amsterdam, Haarlem, The Hague, Rotterdam, Utrecht area) but also the central part of The Netherlands, up to and including Eindhoven and Apeldoorn. The quickest way to request an electrician is via our webform and if you prefer you can also mail, call 020-6750333 (Mon-Sat 8.30-18h) or send a WhatsApp message to 06-15380087. The work of our qualified electricians is covered by a triple guarantee: the guarantee by the electrician himself, his liability insurance and finally our MrFix leverage over the electrician. So you are in safe hands. Need an electrician in your region? Whatever your electrical job is, MrFix has the best network of experienced, reliable electricians in Amsterdam, Rotterdam, The Hague, Utrecht, Eindhoven and elsewhere in the West and Centre of The Netherlands. Fill in the form above, then we will match you as quickly as possible to the right electrician or other expert in your region.